Delinquent mortgage loans continue to be a problem for the South Florida residential real estate market. 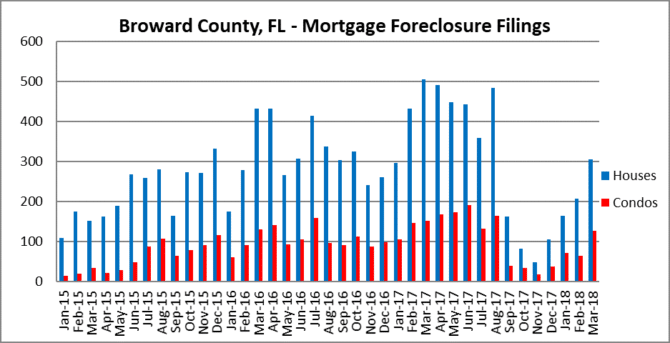 As we move through 2018, it sure looks like mortgage foreclosure filings are picking up steam. For some reason local agents fail to mention the amount of distressed properties that continue to plague the South Florida market. They like to talk about the strength of the residential market and limited supply, yet they ignore the thousands of properties still locked in the foreclosure process after nearly a decade of “recovery”. 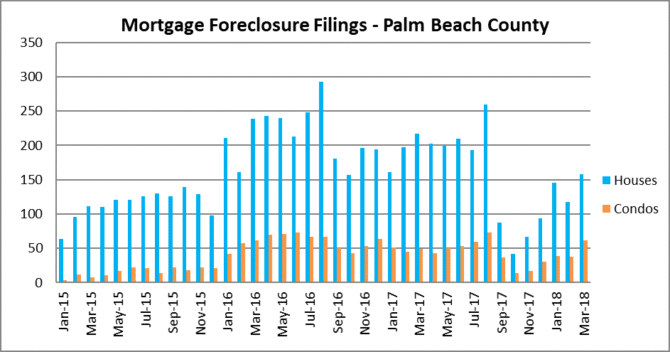 Today we will look at the monthly foreclosure filings in Miami-Dade, Broward and Palm Beach County Florida. The charts clearly show that this problem will not go away anytime soon. 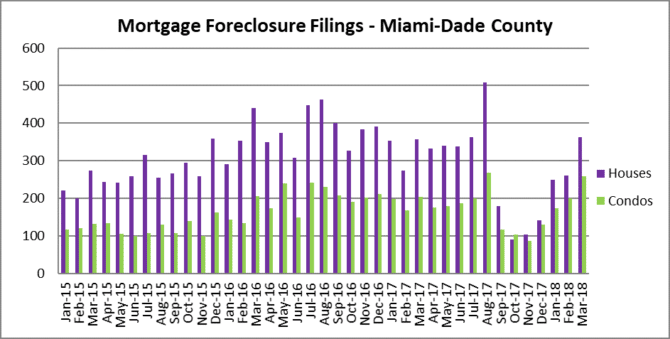 The first quarter of 2018 showed a steady climb for mortgage foreclosure filings in Miami. The chart above shows the single-family home and condo market filings. As for the annual numbers and monthly averages, take a look at this next chart. Keep in mind that the 2018 numbers are just for the first quarter. The number of mortgage foreclousure filings continue to climb in Broward County as well. Believe it or not, the beautiful areas of Palm Beach, Boca Raton and Delray Beach continue to wrestle with residential mortgage foreclosures. the numbers may not be as large as the Miami and Fort Lauderdale, but the pace of growth in delinquent loans is comparable. We often come across interesting articles that shed additional light on topics posted on the blog. Here is an interesting article that discusses how institutional investors have welcomed back subprime loans to their portfolio, now re-labeled as “non-prime” residential mortgage loans. Subprime is back! Well, that didn’t take long. This entry was posted in Foreclosure activity, Fort Lauderdale foreclosures, Market Insight, Miami foreclosures, Palm Beach foreclosures, Shadow Inventory and tagged Fort Lauderdale foreclosures, Palm Beach foreclosures, REO. Bookmark the permalink. Both comments and trackbacks are currently closed.